The Pines at Utica Center for Health & Rehabilitation welcomes you, and thanks your for choosing our center for your healthcare needs. An exceptional community healthcare resource for many years, we exceed expectations in meeting the needs of individuals who require short-term skilled nursing care. Our staff of concerned and dedicated professionals is committed to helping everyone through providing support and guidance on a one-to-one basis. Whether you join us for a brief stay or call us your home, we want you to feel as comfortable as you would amongst family, while receiving care such as physical therapy, occupational therapy, or speech therapy. The Pines at Utica Center for Health & Rehabilitation also provides a myriad of medical services including pulmonary rehabilitation, heart failure services for CHF, cardiac recovery, amputee rehabilitation, stroke rehabilitation and wound care management to name a few. The Pines at Utica Center for Health & Rehabilitation prides itself on our customer service and maintains a common commitment to the highest level of quality care, a focus on customer service and providing a nurturing environment for both patients and families. 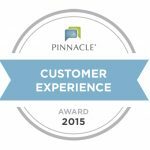 We are pleased to have received a“Customer Experience Award – 2015” from Pinnacle Quality Insights demonstrating our center’s commitment to the “Four Pillars” of our mission statement: Kindness, Compassion, Service and Excellence. I chose The Pines at Utica for my rehab because I was looking for something close to home and I heard of it's good reputation. I have to say that the entire staff: nurses, therapists, social workers and aides all seemed to really enjoy their jobs and showed genuine care not just for me but for all the rehab patients. I'm grateful for such a positive experience. The staff here are the friendliest people I have ever seen in a health care setting. They are so attentive and go above and beyond to help you. The therapists are great! The staff really put a personal touch on you and go the extra mile to help you out for whatever you need. I chose The Pines at Utica Center for Nursing and Rehabilitation when I had hip replacement surgery and needed to rehab and return home as soon as possible. I had a very positive experience at The Pines. The therapists were very good as well as housekeeping. The rooms were well kept and cleaned often. Chelsea and Corrina in the nursing department were very helpful as well as Andre and Zach from therapy. They encouraged me to be successful in my rehab and took great care of me. I would definitely recommend The Pines for rehab. Thanks so much! "I am very pleased with my stay here. I can't thank everyone enough! I would definitely recommend The Pines at Utica to anyone." I was a rehab patient at The Pines at Utica recently and I have nothing but good things to say about the care and attention I received. The Therapy Department is outstanding and the Housekeeping was really great, the cleanest place I’ve been to. I would choose The Pines over any other facility in the area as I have been to others and this is the best! My loved one, Steve Gates stayed at The Pines At Utica and had a very good experience. The staff is very good at their jobs. Very thoughtful, pleasant and helpful. Justin, Jackie, Cindy, Julie, Katelynn, Makayla, Tina, Peggy, Chelsea, Jodie....all just wonderful, very caring. My name is Christian Thater and I chose the Pines at Utica for myself. Fortunately for me, my wife is the one who was previously involved in the medical visit to The Pines to see what the facility was about. The facility offered clean rooms, doctor and nurses on 24/7 duty as well as a six day a week physical therapy program. But a building filled with people does not always make it the best option, it is the people employed there that make or break it. The administration at The Pines has established top teams; from the housekeeper, Elsie, who always made sure that I had ice and a clean room, to the people who took care of my every need. Justin, the lead nurse who was always available to solve any problem that occurred during my stay. It seems as if the administration has taken special care in its hiring of aides that made my stay easier. There was Crystal, Becky, Jeanne, and so many more. Even the night shift, like John, the LPN would pop their head in and ask if everything was ok. John was very good at giving shots too. Jasmine, the night aide always made sure she was available to me if I needed her. I have to give mention to 2 aides that were very special. Julie and Jackie, the night shift. They would always check to see if I needed anything before going off duty. There is also a certified wound nurse on staff who is outstanding. Rebecca, who oversaw my surgical wounds and special needs. There is a full time physician on duty, Dr. Peters, who not only made rounds but would stop you in the hall, call you by name and ask if there were any problems. The PT and OT were outstanding and I have been to other physical therapy treatment rehab centers compare. I worked with Andre, PT who would come to my room to personally take me to PT/OT rehab area. He always offered the encouragement “you can do this”. He took excellent care of me. Jenn W. the OT therapist taught me how to use tools to solve problems like dressing and putting on shoes as well as rebuilding muscle mass. The Saturday crew of Kim, Richard and Zack taught me some different things to try. Since I needed special equipment for my recovery, Jason the director of the PT/OT worked with me and oversaw all my special needs. Also on staff is Steve who prepared me to leave The Pines. He knew what my insurance would accept and what was available to me. He made arrangements for me that worked out really well. Overall, The Pines more than met my needs and helped me to recover to where I am now. Your Therapy Department did a great job with me! This is my second time at The Pines at Utica for rehab and I would definitely recommend it! “I was able to pre-book my rehabilitation stay at the Pines at Utica for my Left Knee Replacement. Right from the start to the completion of my therapy, I was treated like a friend, not just a patient. Therapy was wonderful and the rest of the staff was so caring. The food was good too! I would highly recommend the Pines at Utica. The staff really do care here! "Thank you for my daily workouts. Without your direction and dedication, I wouldn't have made it. You have made my recovery enjoyable." I would really like to recognize the therapy at The Pines at Utica. Deanna and Kristyn both went above and beyond to help me achieve my goal. Their motivation and encouragement got me back on my feet and I'm happy to report I'm going home!! I was here before for rehab and loved my stay! I needed rehab again and wasn't going to go anywhere but The Pines at Utica. It's like family here. The decision that I had made to go to The Pines at Utica Center for Nursing and Rehabilitation was one of the best ones that I have ever made. The entire place is top notch. I would give everything a 5-star rating. I could not be more pleased with the kind and caring staff or the beautiful facility that they have. I’m coming back next year after my surgery! The nursing and therapy are beyond excellent and the nursing assistants were outstanding to me. I wish I could stay longer. I would highly recommend The Pines at Utica Center for Nursing and Rehabilitation.